A group of thugs has kidnapped your brother's girlfriend, and now it is up to you to rescue her. It's just you, the Black Warriors Gang, and maybe a second player. 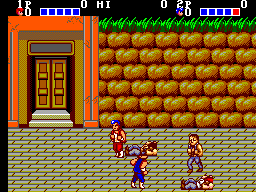 Double Dragon for the Master System is almost exactly a port of the arcade, but it has a few differences. These will be explained later. 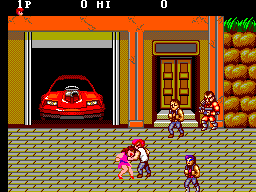 In other Double Dragon games, Marian is Billy's girlfriend, but that's just one difference. In the NES version, for example, this changes are even more drastic and Jimmy turns out to be the arch-enemy at the end. 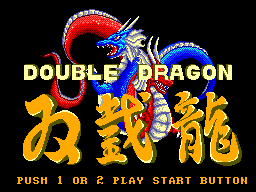 Double Dragon is the typical fighting game. You know; punch, jump, kick and such. But, I think it's the level of difficulty that makes it a great game. It's not too easy. On your way to rescue Jimmy's girlfriend, you will encounter many enemies. These include Lindas, Williams, Ropers, and my personal favorite, Abobos. These giant rock-like creatures are one of the strongest enemies in the game. Two player-capability adds to the fun of this game. It's very hard with just one player, so having the ability to split the enemies who attack is an advantage. One particular thing that catches my eye is the advertising SEGA hides in this game. On the second or third level, you will notice a box on the side of the room. What does it say..."SEGA." Oh, and you can also pick it up and throw it, so it's nice to know that if there were Brazilian TecToy versions of Sonic Chaos and Fantasy Zone in there, you just broke 'em! SHAME! There are many items like the SEGA box that you can use as additional weapons. Instead of just having your hands and feet, you can pick up dynamite, knives and baseball bats. Those are just a few items. There are also giant metal barrels you can throw! YAY! But often when the enemies attack you with something like dyanmite they can usually be forced to walk into a stick that's already been thrown, so there's another way you can use weapons. This is one of those games you keep playing for a long time, but once you get used to replaying the same levels over and over again, just to get to another, you get tired. But if you can get past the levels you are stuck on, this game is great. It's very challenging with the number of hits needed to defeat an enemy. The bosses are mainly just enemies with higher attack or more health. For example, the boss of level one is an Abobo. These guys are not too tough. Other bosses are often basic characters with different color skin. The graphics are great for a Master System game. Instead of looking like normal, dull, boring 8-bit pixels, they are shaded, adding an effect that makes them almost look as if they are 16-bit. The backgrounds are very good, too. But I still don't get the poster seen on the wall of the first level. It's of a man under the words "BBC". British Broadcasting Channel? I dunno. They backgrounds can be very detailed at times, and they can also attack you if you're not cautious. There are stone walls that have bricks move in front of you to trip you, and occasionally there will be a statue that spears you if you're not paying attention! The music is not too great for this game. I think they might have just used the music from the arcade without changing it much. The typical fighting songs for each level differ, but it's mainly just boops and beeps, so they don't catch much attention. They sometimes do get stuck in your head, though! The sounds of punching, kicking, and jumping don't vary much either. Whenever you attack an enemy, you usually get the same sound. And whenever you kill an enemy, you'd expect to hear A)the groaning of them, or B)their body hit the floor. You hear neither. Instead you get a little jingle. You just killed someone! I don't need to hear a happy sound! The controls are very annoying in this game. Sega should have added a third button to their controllers after they made games like this. To jump kick, you have to press 1 and 2 at the same time, and this often does not work, and can be very annoying. Besides that, there isn't too much to worry about. The kicking and punching is okay, but not too smooth as I hoped it would be. Sometimes (most of the time), your attacks miss, and you are forced to try again. Moving around is easy, but sometimes your character doesn't move fast enough, so it loses that arcade feel. Thanks to the circular D-Pad it is often hard to manuever Billy or Jimmy Lee where you want them to go. But I give credit to the creators, because instead of just having you be able to move up, down, left, and right, you can also move in diagonal directions by pressing the corners of the D-Pad. The enemies also, I guess you could say, take advantage of these flaws. They can often get the first attack in, or while you are punching them non-stop, if you don't press the right button, they can kick you and this was aggravating at times. I found you had to move up while attacking to avoid getting hit. This game is one of those games that you pick up every month or two and recall the fun times you had with it. Then you plug it in and turn it on, and get to the fourth level, die, and say you hate it. This will repeat for a long time, so I'd say that it has a pretty good replayability value. You wind up just playing the same levels over and over, because you can never get past that one enemy who always kills you, or you run out of lives. This game is for the people who want a good fighting game, or want to remember the times they had with it since this title has so much history behind it. If you hate fighting games, then you will hate this game. It is often very hard to get past certain levels, so I would not take beating this game too seriously. But if you do ever see it for cheap, buy it, and you won't be sorry. I got it for Christmas a long time ago, and I am still playing it.